Transmission | What is a Transmission? When it comes to the composition of a vehicle’s powertrain, the transmission is the most important component used to generate power for the rest of the vehicle. The term “transmission” refers to a car’s mechanical gearbox that uses gears and gear trains to provide speed and torque conversions from a rotating power source, such as the engine, to a secondary device. This secondary device is the drivetrain or powertrain. By acting as a mediator between the engine and the drivetrain, the transmission is responsible for dispersing the energy evenly to the wheels; this is what allows the vehicle to accelerate. The process is completed by the shifting of internal gears to disperse an accurate output to the energy provided by the engine. This process is similar to how a mountain bike requires gear changes to adequately disperse energy when dealing with different inclines. The operation of a manual transmission is the process in which the driver shifts gears “manually” using both a movable gear selector and a driver-operated clutch. This type of transmission is commonly referred to as “stick shift” or “standard” transmission due to the nature of the center console’s composition. To understand how a manual transmission works, the manual transmission in cars is operated in the same fashion you would expect a bicycle to work. As you operate the pedals of your bicycle, you’ll notice the gears shifting higher or lower, allowing for slack to be tightened or released from the bicycle’s chain. By allows tension to tighten or release the gears can shift before re-locking and reconnecting. This process is the same way manual transmissions in vehicles works. By disconnecting the connection between the engine while shifting gears and re locking once a gear is selected the transmission can adequately disperse power. Since the transmission is manual, the driver will be required to use the center console to shift gears manually to re-lock the clutch. The operation of the automatic transmission is similar to that of the manual transmission as the “automated manual” requires a mechanical clutch to operate. This difference is seen through the actions performed by the clutch, as it is not controlled by the driver’s clutch pedal but rather by using its automated “pneumatic controls” or hydraulic controls. Often referred to as a “Direct Shift Gearbox” (“DSG”) or a “Sequential Manual Gearbox” (“SMG”), this transmission allows for either fully automatic forward gear shifts, manual shifts through the gear selector, or by the use of buttons or paddles located on the steering wheel. The CVT transmission uses a continuously variable drive ratio (as opposed to conventionally stepped gear ratios found in the other transmissions) and uses belts, pulleys and, sensors rather than gears to maintain a steady acceleration curve. Because of this, a CVT can keep the engine in its optimum power range, increasing efficiency and gas mileage. While in operation, a CVT can provide maximum power to a small engine, allowing for quicker and more responsive acceleration. Thanks to its composition, a CVT provides seamless acceleration without pauses for gear shifts and eliminates the need for abrupt downshifting when additional power is required. This attributes to the smooth operation provide while the vehicle is climbing hills or ascending up steep inclines. Since CVTs are lighter in weight, they can deliver optimal power efficiency which improves a vehicle’s fuel economy. That is why many recent hybrid vehicles come standard with CVTs. A Transmission can cost Thousand of Dollars to Repair. Regardless of its composition, transmissions utilize toothed “gears” that interact with each other to produce torque. The “gear ratio” refers to the gears’ relation to one another during operation. To further elaborate, if you have an input gear with 20 teeth interacting with an output gear that has only 10 teeth, the 10-tooth gear must make two full rotations for the 20-tooth gear to spin once. The gear ratio is calculated by taking the number of teeth on the output gear and dividing its total by the number of teeth on the input gear. Thus, the gear ratio in this example is 1:2. This can be further simplified to 0.5:1 to show how many times the output gear must rotate for the input gear to make one full rotation. In neutral, the engine disconnects from the vehicle’s drive wheels which allows the vehicle to be pushed or pulled with ease. While in reverse, the drive wheels run in the opposite direction to allow for the vehicle to accelerate backward. If the vehicle’s transmission is in park, a latch mechanism will lock to the drive wheels preventing them from turning. Due to this constant switching, all the operating gears in the transmission are lubricated with transmission fluid to allow them to transition easily. Furthermore, when transmission fluid enters the torque converter activating the clutches and bands. These determine what gear ratio should be engaged and if the planetary gearset needs to be configured to a specific gear combination. There’s really no basis of truth when someone says one type of transmission is better than the other. Automatics and manuals both have their pros and cons and it just boils down to a matter of preference in the end. However, no matter the type of transmission they all require a certain amount of care, and that care starts with the proper maintenance of transmission fluid. Type-F: This specification is mostly affiliated with cars from the 1970’s, it was vastly used in the past. Unless you have a vintage car with a vintage transmission, you won’t need Type-F transmission fluid. Highly Friction Modified: HFM transmission fluid are for vehicles that need a lot of reduced friction. Dexron/Mercon: Notably the most widely used Automatic Transmission Fluid specification today. Both Mercon and Dexron have comparable standards which is why they are often grouped together. Both of which have frictional modifiers that range in higher/lower grades. Synthetic Fluid: – Synthetic fluids are very popular with many aftermarket brands that closely meet Dexron and Mercon specifications). Synthetic fluid offers better performance and service, with improved resistance to heat, cold, oxidation, friction, and shearing. Many manufacturers are adopting synthetic fluids nowadays as they are simply better although they often cost more. Want to know the type of transmission fluid you need? Transmission fluid changes are required, as just like engine oil the transmission fluid can be “gunked” up with debris and other incoming materials that build over time. If you find yourself with a ton of debris inside your transmission, it’s likely you’ll need to have a transmission flush done. Unlike engine oil, transmission fluid is only required to be replaced around every 30,000 miles. 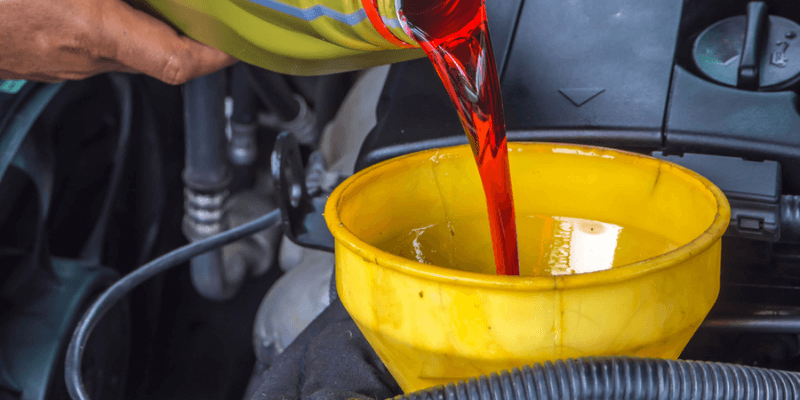 Transmission fluid acts in the same way that engine oil does, meaning that it coats the internal metals to avoid overheating and possibly metal components melting. Since the transmission generates a large amount of heat it is entirely possible for the transmission to be warped or damage if there is a lack of lubrication protecting the outside. So, there are signs you should be aware of to prevent a transmission failure. An active transmission light means that your transmission fluid is running hotter than normal thus causing your transmission to operate at a higher temperature. If this light is on, check your transmission fluid level and engine coolant level immediately. An overheating transmission can cause catastrophic component damage resulting in a huge repair bill. If any hesitation occurs, that is a sign that something is wrong. Transmissions were designed to go into the “correct” gear specification every time. Therefore, any delayed response from your vehicle means you are having transmission issues. Automatic transmission will show a delay when shifting into park or drive. Checking transmission fluid with the transmission’s “dipstick” is one of the quickest most inexpensive way to get a reading on your transmission’s health. If you have rear-wheel drive, the dipstick will be located toward the rear of an in-line engine. Front wheel drive dipstick’s will be sticking out of the transaxle. Always refer to your owner’s manual guide for further help. Some cars require the transmission’s gear state to be in neutral or park, or to have the engine warmup before pulling a dipstick reading. If you notice any “burnt smell” and or debris on the fluid, you should immediately have your transmission fluid changed.